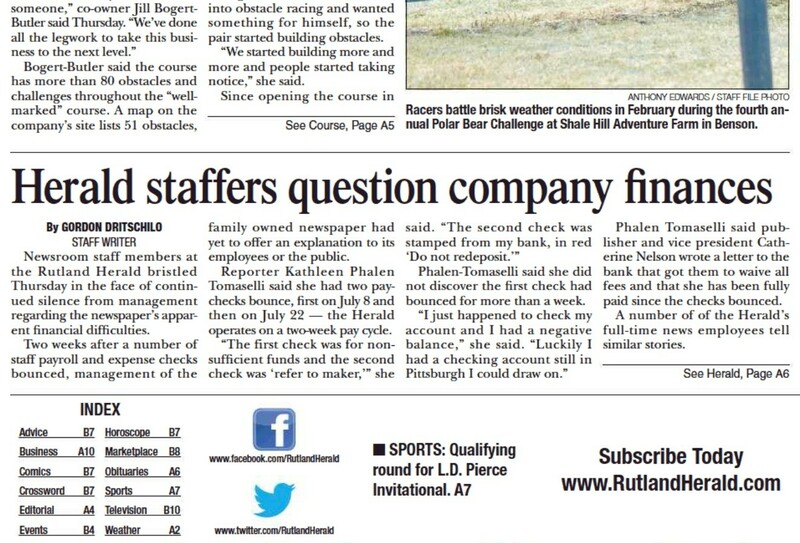 Employees of the Rutland Herald spoke out against their bosses Friday — on the front page of their own newspaper. In a story quoting five newsroom staffers and freelancers by name, Herald staff writer Gordon Dritschilo wrote that his colleagues "bristled Thursday in the face of continued silence from management regarding the newspaper's apparent financial difficulties." As Seven Days reported Wednesday, the family-owned Herald and Barre-Montpelier Times Argus have not been reimbursing employees for expenditures and have not been paying some freelancers at all. According to Dritschilo's story, "a number of staff payroll and expense checks bounced" in recent weeks. He quoted photographer Anthony Edwards saying that he stopped working for a time after going weeks without pay because he could not afford gasoline. Edwards was forced to borrow gas money from his mother. "It wasn't a lot, but to us it is," Edwards told the Herald. Dritschilo reported that "a number of checks did go out on Wednesday after the situation with freelancers was mentioned at the bottom of an online column in Seven Days." But on Thursday, according to an email obtained by Seven Days, employees received word that their pay would not be delivered in the usual manner. "Update — there will be no direct deposit for tomorrow's pay period," business manager Deborah Morse wrote in a companywide email. "Physical checks will be available tomorrow — check in with your supervisor." Morse did not immediately return a call seeking comment Friday morning. After word spread about the pay delay Thursday, Dritschilo reported, "a number of newsroom employees confronted" publisher Catherine Nelson "and she again declined to explain what was going on ..."
According to several sources, management has blamed the cash crunch on its apparent move to another bank. Those sources say Nelson, owner R. John Mitchell and editor in chief Rob Mitchell have declined to provide further details. None of the three responded to repeated requests for comment this week. The payment issues extend to other publications owned by the Mitchell family, including Business Vermont. According to one person with direct knowledge of the situation, its writers have not been paid in more than a month. "This is a business publication not paying its business writers who are writing about business practices in Vermont," the source told Seven Days. "Uh, hello?" Note to readers: If you have direct knowledge about this unfolding situation, call Paul Heintz at (802) 598-8946 or email paul@sevendaysvt.com. We will guarantee your anonymity.